Laugh in the face of weather forecasts with a full heavy-duty cab enclosure. Starting with a tilt-up windshield and wiper kit, doors with electric opening windows in front, hinged window opening in rear, and ending with a useful sliding rear window. When you’re working or hunting outside in colder climates, escape bone-chilling temps by climbing into a toasty warm cabin and firing on the integrated heater—yeah, it's as good as it sounds. 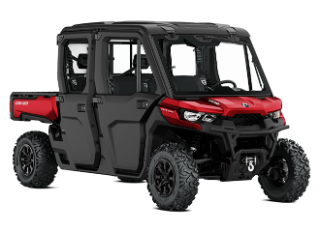 This is it: at the heart of this Defender is a 72 horsepower / 61 lb-ft torque Rotax HD10 V-Twin specifically tuned for serious work, a proven companion in the most demanding conditions that ranchers, farmers, and outdoorsman face every single day. Dynamic Power Steering (DPS) is tuned for utility while returning renowned Can-Am responsiveness for recreational riding. DPS improves steering feel in slow-speed working situations and in more technical terrain. It's also designed to offer less assistance at high speeds and more assistance at low speeds. Visco-Lok† QE front differential combines a lockable rear differential and a 4-mode traction system for multiple choices depending on terrain or task. With separate front and rear toggle switches, drivers can select between a 2x4 open rear differential for tight turning and turf protection, a 2x4 locked rear for improved 2WD traction, a 4x4 open rear for more maneuverability in rugged terrain, and a 4x4 locked rear differential for maximum traction. The rear differential is gear-on-gear to the transmission for better response, no maintenance, better efficiency, and fewer components. With the power of the Rotax HD10 at your back and Visco-Lok 4WD underfoot, there's different ways to use all of it: Work, ECO, and Normal driving modes maximize response depending on the situation. Work mode gives full power and prioritizes low-down control and response, key for towing, hauling, and maneuvering with ease; ECO helps to save fuel and remain easy on terrain. The XT package VERSA-PRO bench seat includes a reinforced seat cover with thicker vinyl and a special material finish to be both more durable and attractive. The Defender vehicles’ high-quality seat cover is designed to endure the everyday use on the farm, job site and trail. It's also adjustabile, with a 3-in (8 cm) adjustable driver’s seat (forward/rearward) for added comfort and better ingress/egress. The Defender has a total of up to 14 US gal (53 L)—including a handy, removable and water-resistant 1.7 gal (6.3 L) toolbox, an industry exclusive—to carry tools and supplies directly where they're needed. In addition, we included 1.6 gal (6.1 L) of under-dash storage with an enclosed pocket, under-seat storage, and enclosed storage above the gauges. Ready to go when and wherever you are, Maxxis Bighorn 2.0 tires offer a smooth ride, predictable cornering, and optimum climbing confidence and are installed on redesigned durable, lightweight cast-aluminum wheels. For 1 year after you take delivery of the Defender side-by-side, we defend its hardworking abilities with a full factory warranty.